Few dishes are as reminiscent of childhood treats than an ice cream sundae. 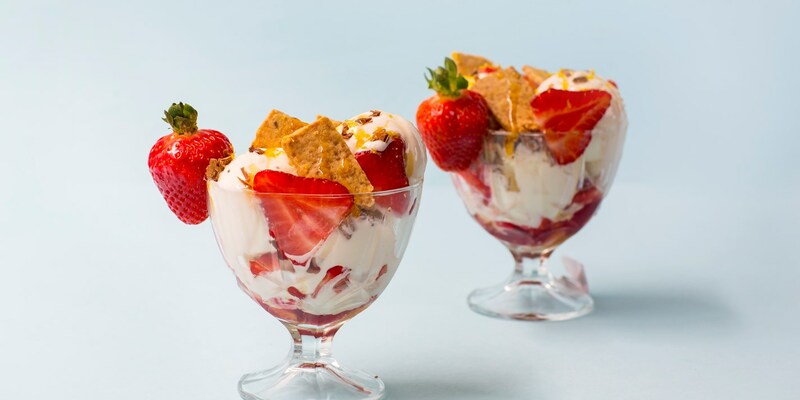 From towering knickerbocker glories to sultry chocolate-drizzled ice cream creations, these fun desserts, packed with ice cream and a plethora of fruity or richly indulgent treats, are evocative of carefree summer fun and the sheer joy of indulgence. Our collection of ice cream sundae recipes has something for everyone, young and old. A joyous Raspberry and coconut sundae would make a great treat for the kids, packed with raspberry coulis and chocolate ganache, while our Strawberry and heather honey sundae will satisfy even the most sophisticated palate, topped as it is with lavender shortbread. Francesco Mazzei offers a glorious Italian spin on the sundae, combining homemade hazelnut gelato with meringue, tuiles and chocolate crumble for a next-level, cheffy take on this classic dessert.